TG Thomas, or Dr. Tom as he is widely known, is a proud member of an Optimist Club. How do I know? His Facebook profile picture, shared at the right, says so. 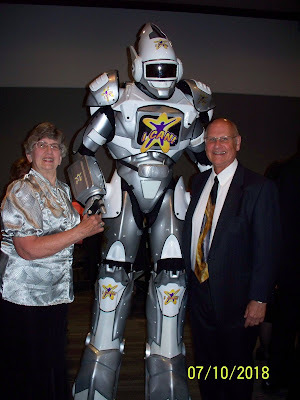 Dr. Tom is also the Vice President-designate for the West Coast Region, Optimist International. He will visit the PNW District as the International Representative in Lebanon, Oregon, August 9-11, 2018. 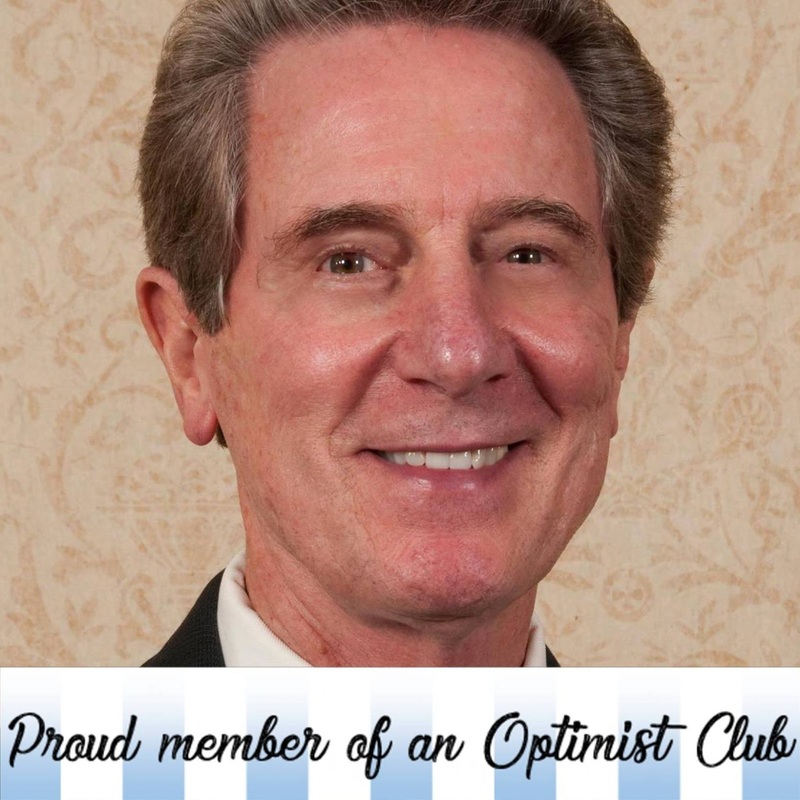 Dr. Tom is an accomplished Optimist Club and District leader. He led the Pacific Southwest District to be a Distinguished District in 2012-2013 and earned the recognition of Outstanding Governor of the Region, a recognition determined by overall growth. In addition to being an advocate for growth, Dr. Tom is health conscious and has sparked initiatives in his home district to help improve the children's health and reduce childhood obesity. He will share some of his ideas as part of the leadership training and motivation that will be provided at the convention. Please be sure and register, if you haven't already. Reduced prices are available until August 3, 2018. Hurry! We can't wait to meet you! Read about the Lebanon Optimist Club in The Optimist. Currently, with 93 members, the Lebanon Optimist Club is nearing the 100-mark on its membership roster. It takes enthusiasm and purpose to meet the expectations of that many people in a small community. In my mind, that means the Lebanon Optimist Club has tricks it can share with other Optimist Clubs about member recruitment and retention. You and other members of your Optimist Club can learn from the Lebanon Optimists first-hand by attending this year's PNW District - Optimist International Convention. It is taking place August 9-11, 2018 at the Premier Boulder Falls Best Western, 505 Mullins Drive, and Lebanon Convention Center, 605 Mullins Drive, Lebanon, Oregon. Meeting members of the Lebanon Optimist Club is just the beginning of the exciting weekend that is planned. The Lebanon Optimists are taking their hosting duties seriously and according to District Secretary/Treasurer Mary White and Convention Co-Chair Weezie Devinny, the excitement begins Thursday morning with a golf outing for the early arrivals. The opening session, Thursday evening, will feature a performance from Lebanon's Dance School for entertainment and a professional singer performing the Star Spangled Banner and Oh Canada. (Rumor has it the singer is Weezie's twin brother!) Presentation of the flags will be conducted by the Dalas Cadets. Following a day of training for club and district officers-elect, the Lebanon Optimists will take the group on an adventure to Sweet Home via the Santiam Excursion Trains. After the 1.5-hour trip, at about 6:00 p.m., attendees will gather at Optimist Gazebo in Academy Square for a barbecue and entertainment by the Wild Hog String Band. Community members will likely join the group for the evening entertainment as this is a public facility. Saturday features the district board of directors meeting and election of the governor-elect 2018-2019. There will also be roundtable discussions and time for club project sharing in the afternoon. At 5:30 p.m., all Optimist Club members, and their guests will move to the social hour and Governor's Banquet where more entertainment awaits featuring a silent auction before dinner and the LHS Jazz Band after dinner so you can end the evening with a dance or two with your Optimist friends. Kudos to the Lebanon Optimist Club, Weezie DeVinny and Heather McDaniel for the work they've done to make the PNW Optimist Clubs welcome in their community. We're looking forward to meeting the Lebanon Optimists and seeing you there! If you haven't yet registered, please click here to download the registration form. Please click here to view the program on Facebook. 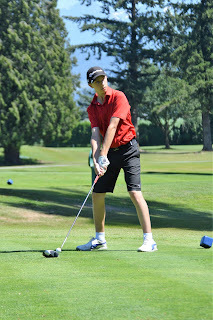 Hosted by the Chilliwack Optimist Club, the Fred Wellsby Junior Divot Golf Tour takes place annually in July. It is a five-round tournament culminating in the Champions Invitational as the final event. This year, sixteen junior golfers, all ages 16 and under made it to the final round played at the Chilliwack Golf Club July 12, 2018. Earning the Champion of Champions title was 12-year old Ryan Burns of Abbotsford, BC. Ryan ended the day with a two over par 74 that included birdies on holes five and six. 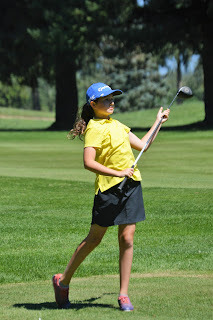 The top female golfer was Sarah Armstrong who closed out the day with a 96. The Chilliwack junior golfer is 11-years old. Photos courtesy of the Chilliwack Optimist Club. To see more photos from the event, please visit the Chilliwack Optimist Club on Facebook. For more information on the tournament, please contact Glenda Standeven. Governor Bruce and Judy Gilbertson traveled to Ottawa, Ontario for the 100th Optimist International Convention July 8-10, 2018. This annual event welcomed Optimist Club members and Optimist District leaders from 23 countries around the world. This year, they were joined by Captain I Can. With a Jamaican accent, the Robot Superhero was there to encourage the assembly to never give up, to accomplish their goals, achieve their purpose, and to help others reach their goals as well. The goal of every Optimist International District is always to reach Distinguished. In order for the PNW District to do that this year, we need every Optimist Club member to say, "Yes, I can. Together, we can!" Join the Captain, the Governor, and your fellow Optimist Club members by promising to make your Optimist Club an Honor Club and thereby ensuring the PNW District's return to Distinguished District status. 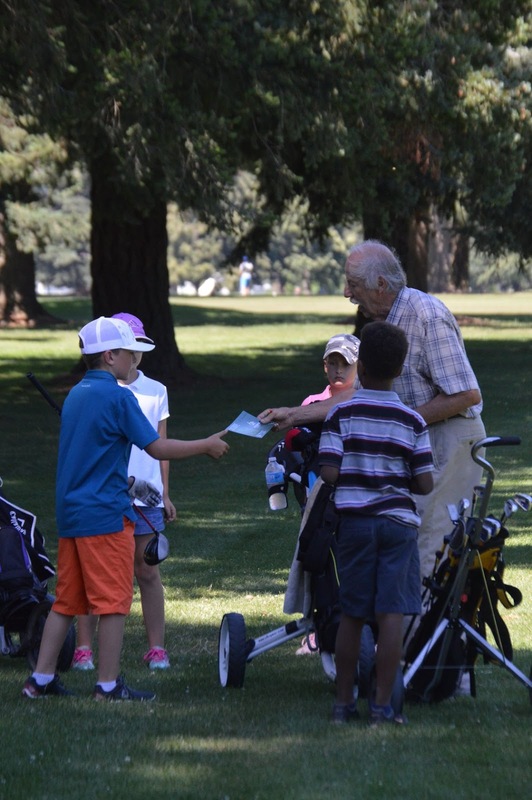 Your individual goal is to sponsor one new member to your Optimist Club. Can you do it? Photo courtesy of Judy Gilbertson. The Optimist International Convention is taking place today through Tuesday, July 8-10, 2018 in Ottawa, Ontario, Canada. 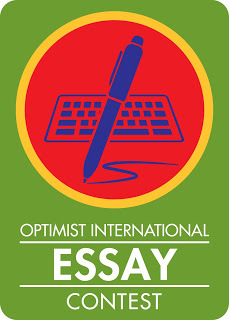 Optimist International Essay Contest - "When All the World's Problems are Solved, is Optimism Still Necessary?" 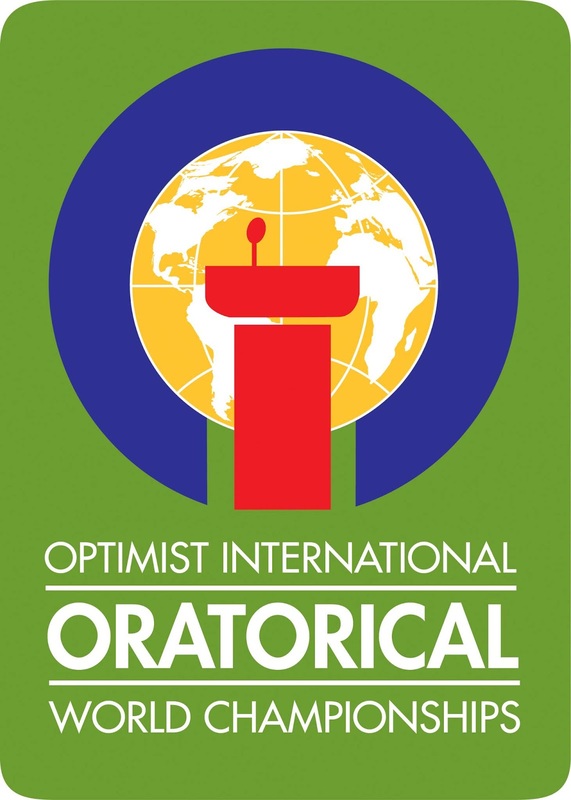 Optimist International Oratorical Contest and Communications Contest for the Deaf and Hard of Hearing - "Is There a Fine Line Between Optimism and Reality?" When available, complete contest rules will be posted at http://www.optimist.org/member/scholarships1.cfm. Please use this notice as a heads-up so that your Optimist Club can make connections with your local schools in August. All scholarship contests begin at the Optimist Club level. If you are a potential student contestant, teacher, counselor, or parent, please find an Optimist Club near you at this link. The Lebanon Optimist Club is excited to welcome the PNW District - Optimist International to their hometown for the 2018 PNW District Optimist Convention. Acting as co-chairs for the event, Weezy Devinny and Heather McDaniel promise a great time with music, entertainment, and of course, the education and inspiration that all Optimist Club members and leaders need to finish this administrative year strong and get started on the 100th year of optimism in a jubilant fashion. 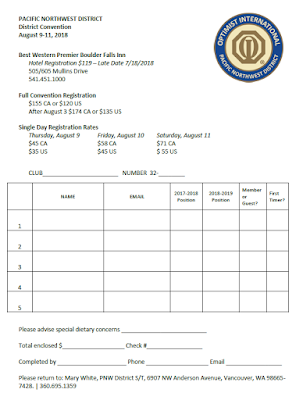 The convention will be held at the Best Western Premier Boulder Falls Inn, 505 Mullins Drive, Lebanon, Oregon. Please register by July 18 to receive the nightly room rate of $119. You may click the registration form on the right to enlarge and print. Registration before August 3 is $120 US or $155 CA. There are also options for one-day registrations. Please check back here occasionally, or on Facebook, because more information will be provided soon regarding the activities of the weekend.